The wearables industry is going to get (no pun intended) a shot in the arm from the healthcare business. 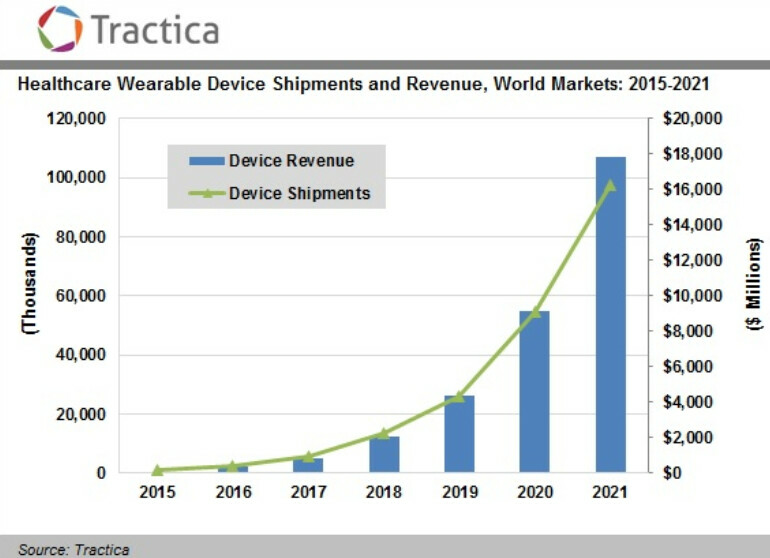 Research firm Tractica predicts that by 2021, healthcare wearables will bring in $17.8 billion in annual revenue. Worldwide shipments of healthcare wearables will soar from 2.5 million units this year to 97.6 million in 2021. Fitness trackers that can monitor your exercises, vital signs (like heart rate) and your sleeping patterns are just the beginning. Wearables for chronic conditions, pain management and remote patient monitoring are expected to soon be employed throughout the world. Even the most basic consumer related device can have a positive impact. Just the other day, we told you how a Fitbit Charge HR saved a life. The wearable helped an ER doctor figure out if a patient brought into the hospital with AFib had a chronic condition, or if the AFib was the result of a seizure. Since the Fitbit on the man's wrist had recorded his pulse, the ER was able to make the proper diagnosis, give him the proper medications, and save his life. Stories like this are bound to become commonplace and lead to more sales of the devices. Tractica research director Aditya Kaul says that healthcare wearables do have some problems that could be challenging for the industry. Chief among them is the accuracy of the sensors employed. And this goes hand-in-hand with consumer confidence. The more accurate the readings, the more confident the public and doctors will be in relying on these products. If some of these wearables are used as replacements for doctors and diagnose users, you can bet your bottom dollar that the government will increase its regulatory scrutiny of the products being sold to consumers. PA will is a big word........might is more suitable.......as you cannot predict the future! What I wanted is a high tech smart watch which cost less to own. Yet great usability. Not for medical, but for adventure and sports as well. Casio's brand new smart watch is a good example. Same goes for Galaxy gear s2.